Improve your technique and transform your game. 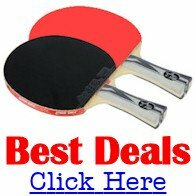 Watch my free videos to learn all the essential table tennis techniques. The real secret to improving your table tennis skills is to improve your technique. Buying a new racket may help you, but improving your technique will elevate your game to a MUCH higher level, much faster. So, to help you master the essential techniques in the fastest possible time, I've made a series of videos for you. All together on this one page, with links to further information, each technique is demonstrated for you by my friend and coach, Steve Foster. If you have difficulty hearing what is being said on any of these videos, you can turn on the subtitles/captions. Just click on the subtitles/closed captions button at the bottom of each video. Learning to use the correct grip is vital if you want to improve your game. Here's a video demonstration of the shake-hands table tennis grip. The ready position is a neutral starting position from which all table tennis strokes can be played. Here's a video demonstration of the Ready Position. The purpose of this stroke is to stop your opponent from playing an attacking stroke, so try to make sure that your shot is played short over the net. Here's a video demonstration of the backhand push. The purpose of this stroke is to play aggressively and stop your opponent from playing an attacking stroke, so try to make sure that your shot lands close to your opponent's baseline or sideline. Here's a video demonstration of the forehand drive. Here's a video demonstration of the backhand drive. The purpose of this stroke is to stop your opponent from playing an attacking stroke, so try to make sure that your shot also stays short over the net. Here's a video demonstration of the forehand push. The purpose of this stroke is to attack a ball that's played short over the net. Here's a video demonstration of the forehand flick. Here's a video demonstration of the backhand flick. Here's a video demonstration of the forehand loop. Here's a video demonstration of the backhand loop. The intention of the forehand smash is to hit the ball as hard as possible, with minimal spin, in order to try and finish the rally and win the point. Here's a video demonstration of the forehand smash. The objective of this stroke is to make the ball to travel in a high arc and land near the base line on your opponent's side of the table so that you have additional time in which to try to recover your position and/or make it difficult for your opponent to win the point. Here's a video demonstration of the backhand and forehand lob. The purpose of this technique is to try and confuse your opponent when you are using a different type of rubber on each side of your racket. Here's a video demonstration of racket twiddling by the ex-England player Carl Prean. Here's a video demonstration of the side-to-side footwork pattern. Here's a video demonstration of the basic service rules.